Posted on June 15, 2017 June 15, 2017 by Rebecca C.
I have always been the odd one. Now, that I am older I wear that badge proudly. One of my favorite pastimes is watching and photographing wildlife. Today, June 15, 2017, is Nature Photography day. I cannot be happier that an entire day focuses on the love of nature photography. In my younger years, I would conceal my interests to be part of the group. Now, well, you may see me lying flat on the ground in front of a bug, turtle or sitting in the middle of the field to capture the perfect photo. I always love to watch people’s faces when I show them some of my photo work. Their expressions vary from amazement to you are definitely “off your rocker”. When I am taking photos, I focus on my subject. The world simply disappears. Do not worry; I am too cautious to put myself in harm’s way. The invention of the long lens helps me capture specific scenes. Turtles are my recent focus. 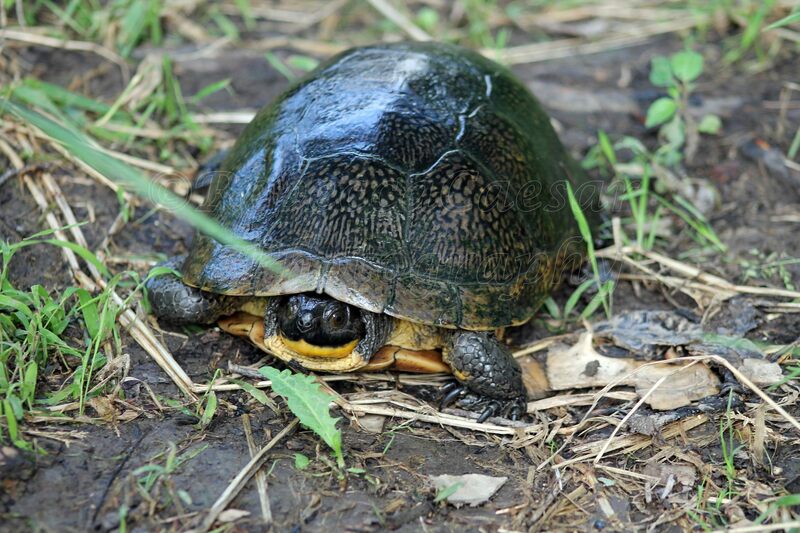 During this time of year, turtles come out the swampy areas to lay eggs. I find the process amazing. Walking past my sliding glass doors, I noticed a creature slowly moving across my yard. 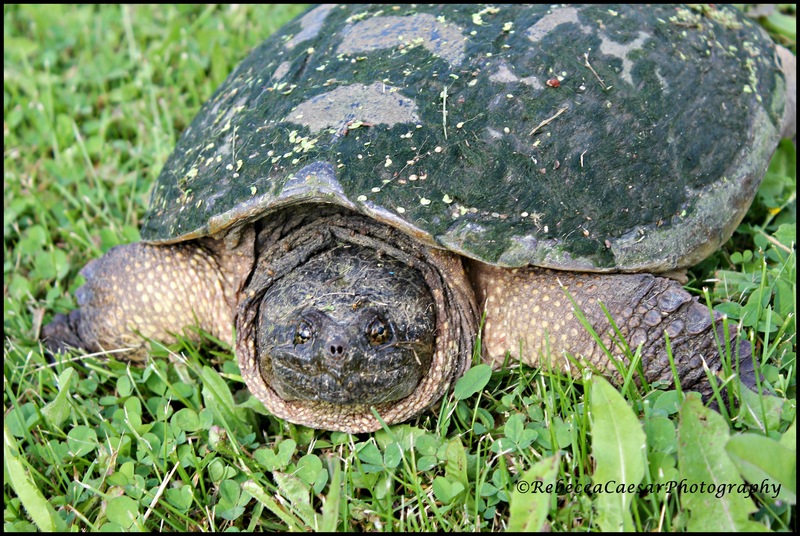 The beautiful Snapping Turtle reminds me of a prehistoric beast. I can just imagine her large ancestors roaming the Earth. I also let my creative imagination work overtime. I recently intertwined a Turtle’s tale in my new children’s book. Time will tell if the story works well. Posted on May 23, 2017 May 23, 2017 by Rebecca C.
Dating back millions of years, turtles are a wonder to watch in the wild. To be honest, I find all wildlife a wonder to watch. I love her eyes. Snapping turtles always look prehistoric to me. Today, May 23, 2017, is Turtle Day. The little turtle swimming away from me. What a wonderful idea to have a day to celebrate these slow moving creatures. Posted on June 9, 2015 June 9, 2015 by Rebecca C.
My morning routine is simple; I sit at my dining room table which is in front of my large sliding glass doors and sip my large cup of tea. As I watched out the window, I noticed a lump in the yard. Of course, I didn’t have my glasses on but my binoculars are always close by. The lump turned out to be a very large Common Snapping Turtle. She had come up from the Maple River to lay eggs. I didn’t get a chance to photograph her laying the eggs. She must have been out there awhile before I even noticed her. By the time I was able to get out to her, she was already on a trek back down to the river beds. The site of seeing this creature wander across my yard toward the back where the river branches off into the creek line is amazing. She is headed across my yard back down to the water. What a beautiful creature! I wish I had enough knowledge to tell how old she was. She was covered in moss and algae. I found her to be absolutely beautiful. Of course, I did not get to close to her. Snapping Turtles are known for their rather fierce disposition other wards they bite. And, I am rather fond of all my fingers. Posted on May 23, 2015 by Rebecca C.
Today, May 23, 2015 is World Turtle Day. I love the fact that an entire day is dedicated to turtles and tortoises. Turtle Day was established in 2000 in association with American Tortoise Rescue. The purpose of Turtle Day is to bring awareness to turtles and tortoises. Turtles have actually roamed the Earth for the last 200 million years. Believe it or not, some of the first turtles had teeth. Turtles can be found on every continent around the globe except the Antarctica. Turtles can be as small as 4 inches to as large as 1500 pounds. Since today is about celebrating turtles, I thought I would share the story of Herman (well, the little Painted Turtle could be a Jane). I honestly do not know how to tell. Anyways, Herman fell down into a ditch that was being tiled for farm use. I figured Herman was coming out of the field or wooded area to find a water source. Of course, we could not allow the little one to be buried. I took the little Painted Turtle down to the pond. I could swear when I let little Herman go, he turned around stared at me. I know he was just swimming away. But I still like the idea that I was able to let the little one go. I think one of the most important things to help turtles is to decrease their demand. Turtles belong in the wild. If people continue to buy turtles or tortoises from a pet store, there will always be a demand. Learning to admire turtles in their natural habitat should be a priority. Learn to advocate for turtles natural habitat. 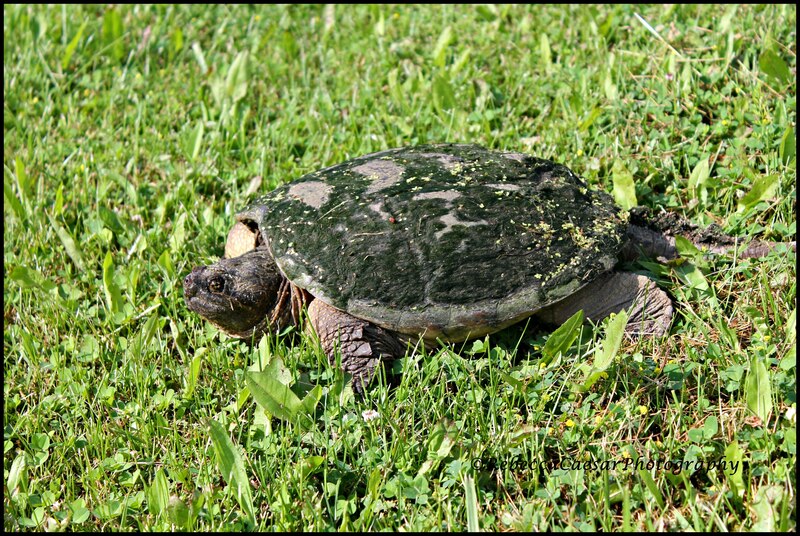 Get involved in environmental issues that may have a negative impact on turtles or tortoises. When habitats are threatened or reduced, a decline in turtle population would occur. I think the loss of turtles and tortoises would be a disgrace. Posted on February 2, 2015 February 2, 2015 by Rebecca C.
Today is considered to be World Wetlands Day; I love these unofficial holidays especially the ones that directly relate to nature and wildlife. Even though today in Mid-Michigan; the entire area pretty much had a snow day. Some areas actually received 18.7 inches of snow last night. Mother Nature just wanted to remind us who really is in charge. Wetlands provide habitat for various types of wildlife and plants. Here in Michigan, we have wetland areas. I will often refer to them as river flats; the name everyone in the area calls them. Wetlands have various benefits. The areas reduce flooding by absorbing the rain or snow melt off. At the same time, wetlands act as a filter getting rid of pollutants and other contaminants by breaking down the material. In Michigan, there are actually three different types of major wetlands: marsh, swamp, and bogs. The river flats are more like marshes. Depending on the time of year, they can an inch of water to several feet deep or completely froze solid. I like these areas; I can grab my camera and photograph all types of wildlife. I have spent hours photographing herons, cranes, ducks, geese, and much more. Swamps are more wooded. They are usually home to various types of little creatures including frogs, owls, and raccoons. The plant life in the swaps can also be beautiful. Bogs are a result of decaying vegetation. 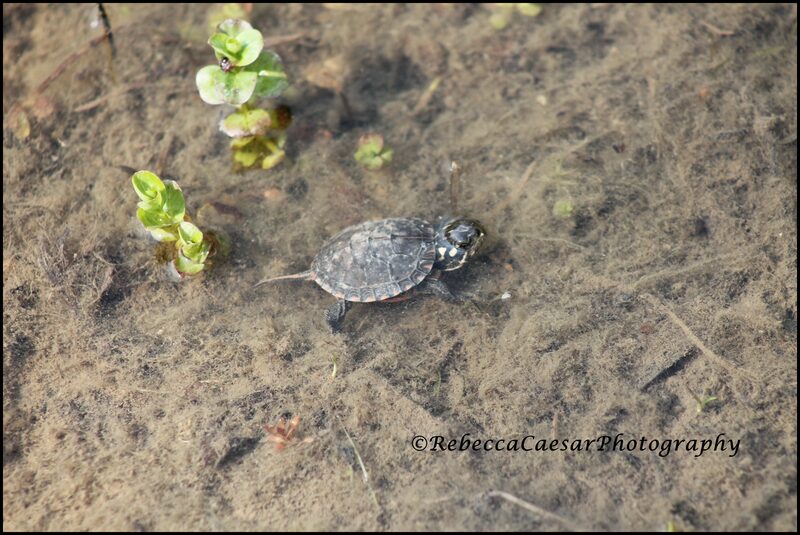 Bogs have different type of animal species including turtles. Watching the wildlife in the wetland areas is fascinating. I can spend hours outdoors during the warmer months. Not today, when the temp is about 3˚F right now. Don’t get me wrong, I do enjoy the winter months too. I just don’t get outdoors as much. So, the next time you see a wetland area on the side of the road while you are zooming down a freeway; take a moment to think about all the wildlife the area has to offer.